Piling On one more card for 2013! It's the final week of 2013, I can't believe it! It's also the final week of our "P is for..." Challenge at Pile It On (deadline January 4). I couldn't resist making one final card! 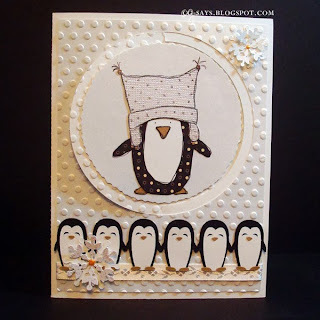 Our sponsor for the month of December is Jellypark, so I used her Penguin with Woolly Hat digi stamp. 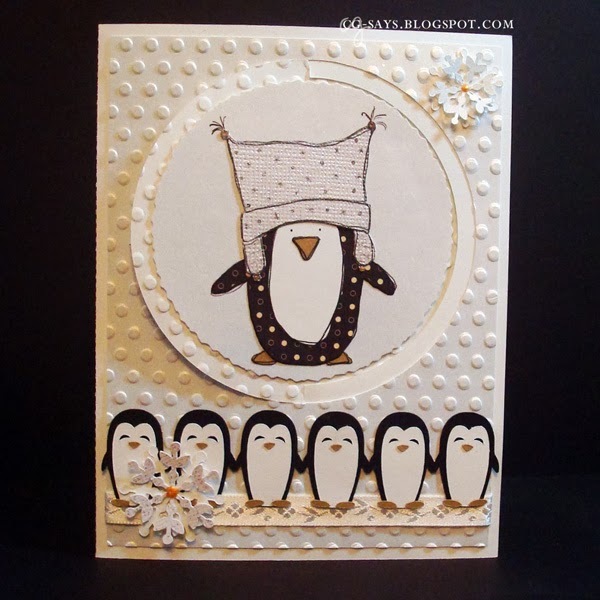 I piled on five "P" items: Penguin, Pocket, Polka Dots, [liquid] Pearls, and Postage Stamp. 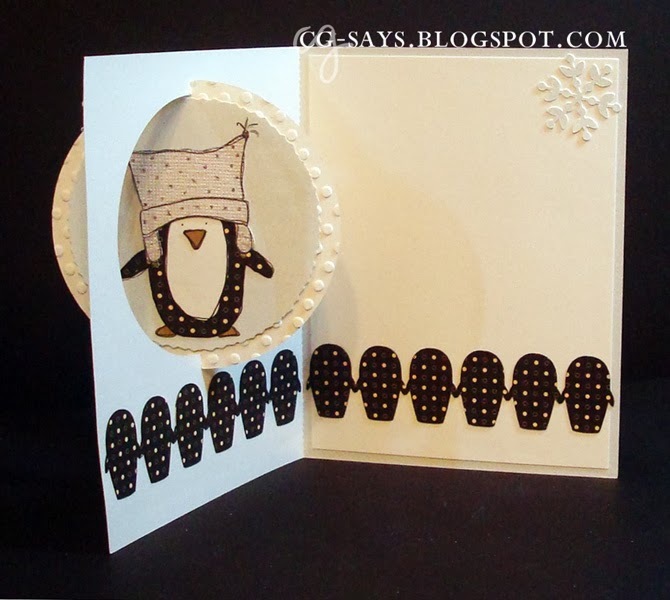 You can check out all the beautiful DT projects, including my other Penguin card, and join the challenge here at Pile It On! I made a lot of these "Diagonal Double pocket cards" this year, as we mostly gave Gift Certificates. 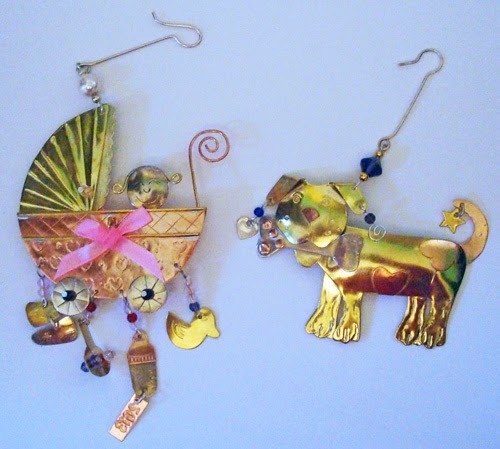 I got the idea from my mom, who had learned the technique at Scraps of Love. It's a variation of Claudia Rosa's tutorial at Splitcoaststampers. 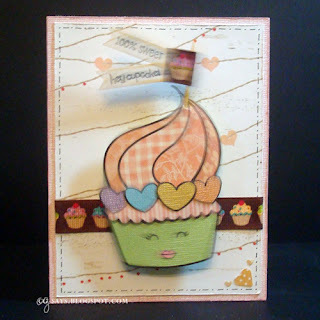 I like it because the card look good without or without the gift and is a fun way to use a double-sided paper, although in this case I used a one-sided paper so that I had white sheet on the inside for the message. This striking black-and-white paper is from a Recollections collection. For the pearl accents, I used black and white Opal Liquid Pearls, and a gold Viva Pearl Pen. The penguin was painted with the same liquid pearls, it worked really nicely. The hat was paper-pieced with a shiny white paper, and detailed with a gold pen. 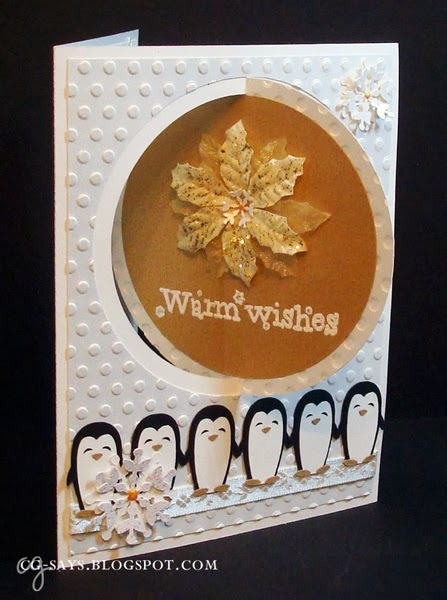 The sentiment piece was embossed/cut with a Christmas present (well, a post-Christmas-sale present, from my mom!) A.C. Moore had this and other specially-priced Pagemap/Spellbinders die sets, and this set goes along with a Pagemaps set I already own. And Mom bought herself a present too! We had such a nice visit. I cut the foil stamp from a white card covered with a gold Rolo wrapper using my Xryon sticker machine, and popped it up with foam tape. I stamped the "warm wishes" sentiment with Staz-on. The middle fold was decorated with a lacey tape, and I added some scrap white ribbon just for good measure. The penguin is on an Action Wobble. So, like many of us, I keep quite busy in the online crafting world: I'm a sponsor/DT coordinator, on 3 design teams, and volunteer twice a week at Paper Playful. However, I just couldn't pass up the invitation to join the Crafting with Dragonflies team. Hey, why the heck not?! This is my first challenge as part of the DT. Our theme for this fortnight (I know that not a word we Americans use, but this is an Australian-based challenge & I really like the word!) is Christmas Tags. So, no cards, tags only! 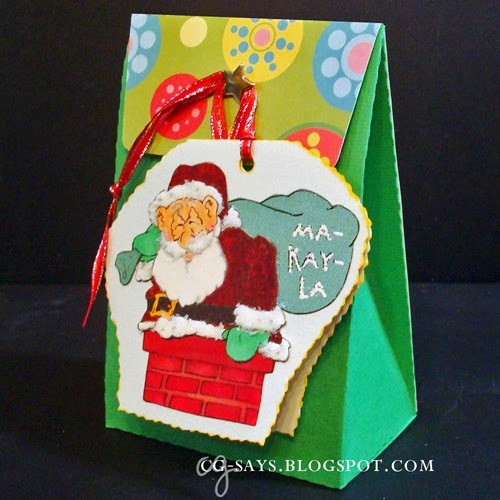 I used Santa in Chimney by QKR Stampede to make tags for some little presents for our nieces and nephews. 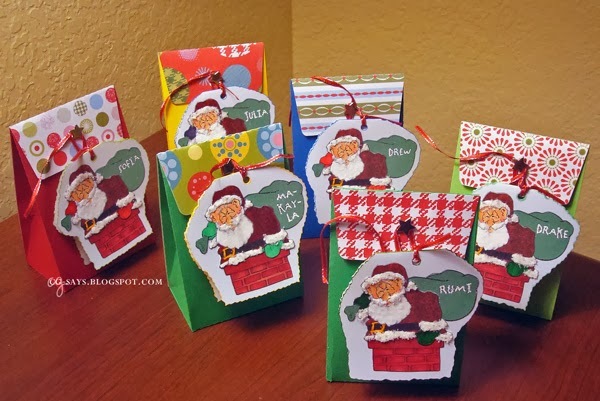 We visited them last month, and my Mom had bought them all sweet little ornaments, so I cut the boxes with my Silhouette (using a design by Lori Whitlock) and added the paper-pieced tags. I pieced the image in three pieces: the base, which includes the chimney; his body and coat (which I digitally paper-pieced with a textured-red digi paper); and his bag, which was cut from a shiny green paper. 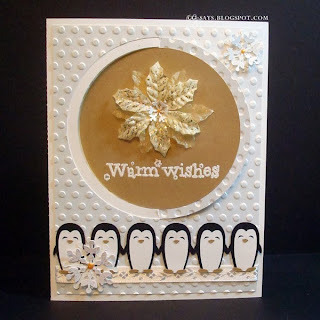 I heat-embossed the names (I have a tutorial here). I used white flocking and Polar White FlowerSoft for Santa's beard and trim. The Pile It On Challenge is having its yearly December-long challenge, this year with the theme P is for...! The challenge will actually run 5 weeks, December 1 - January 4. You can enter as many times as you like, providing it is a new challenge made with our rules in mind. 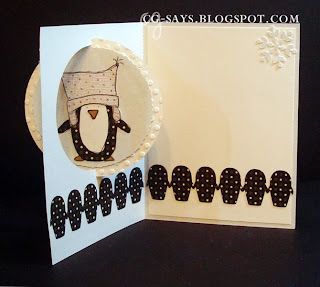 I piled on four "P" items: Penguins, Polka Dots, Liquid Pearls, and Poinsettia. The fabric poinsettias are from my stash, and although the one on top was already pre-glittered, I added some gold Stickles for extra shimmer. The Notch-Swing card design was self-designed; If you'd like to try it yourself, the cutting file are available for purchase in my Etsy Shop. 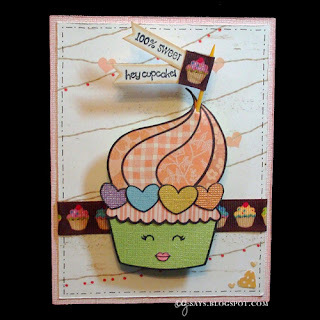 Update: This was the random prize winner for Fab 'n' Funky "Cute Critters" Challenge! Happy December! It's time for a new Sunshine Mail Foundation Challenge. Our theme is "Anything Goes" and the only real rule is that you send in at least one card (it doesn't have to be the card you enter in the challenge; Donation guidelines here).